At Guildford Smiles Dentistry in Surrey, our dentists Dr. Asmaa Seddik and Dr. Marwa Salman are devoted to caring for the smiles of each and every one of their patients. At Guildford Smiles Dentistry in Surrey, Dr. Marwa Salman and her team offer comprehensive dental care for the entire family. It's our mission to help you achieve a healthy smile that looks great and functions well for life. 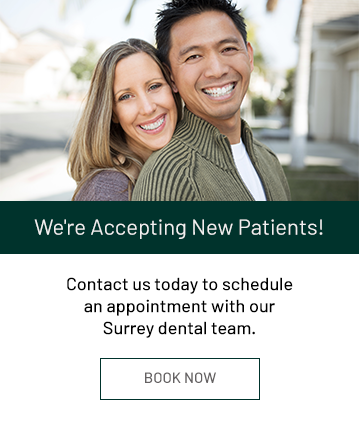 Our dental office is conveniently located near the Guildford Town Centre Mall, and we serve the communities of North Surrey, Guildford, Fraser Heights, and Fleetwood. We accept all dental insurances for the convenience of our patients and accept cash, credit cards, and debit cards for any out-of-pocket expenses. Dr. Salman speaks both Arabic and English to meet the needs of our multicultural community. Our fun and modern office features televisions in our treatment rooms, iPads to entertain kids, and a comfortable and friendly environment. Dr. Salman is committed to continuing education. In addition to the requirements necessary for practicing dentistry in British Columbia, Dr. Salman has sought and completed continuing education courses in implant dentistry and orthodontics so she can provide you with a wider range of services. We'll help you avoid common dental conditions such as gum disease and tooth decay. Straighten your teeth on the sly with Invisalign's patented metal-free orthodontic aligners. State-of-the-art dental technology for a more comfortable dental appointment. Feeling nervous about your dental appointment? Find out how sedation can help.